Hannibal Fagnola. 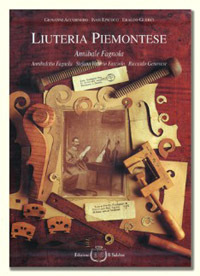 This first major monograph, part of a much larger project that is closely related to all the great Piedmontese violin making modern, was devoted to Hannibal Fagnola, a character certainly atypical of violin-making environment of his time not only an artisan devoted to his activity, but also a man skillful in managing the strictly commercial aspects of his profession, qualities that have made ​​it the forerunner of an essentially modern conception of the craft of the luthier. Fagnola a luthier was able to create his own unique style, combining his undoubted ability and artistic sensibility with the focus on the great violin-making, at the same time bringing innovation in the tradition of Piedmont with a quite personal interpretation of the works of the great masters of the eighteenth and nineteenth centuries such as Giovanni Battista Guadagnini , Giovanni Francesco Pressenda and Giuseppe Rocca . His biography was written after years of research, scientific evidence, the collection of eyewitness accounts of the heirs and analysis of a correspondence of the people who lived close to this great master; this allowed us to reconstruct and finally shed light on throughout his career and his artistic evolution. In a monograph well cared for, could not be forgotten and his students; for this volume dedicates ample space to Annibalotto Fagnola, Fasciolo Vittorio Stefano and Riccardo Genovese. The work was presented in Cremona, Fodri Palace on the occasion of the exhibition of instruments Piedmont titled "Makers of Piedmont, between the nineteenth and twentieth centuries, from Pressenda to Fagnola."